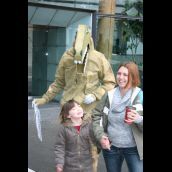 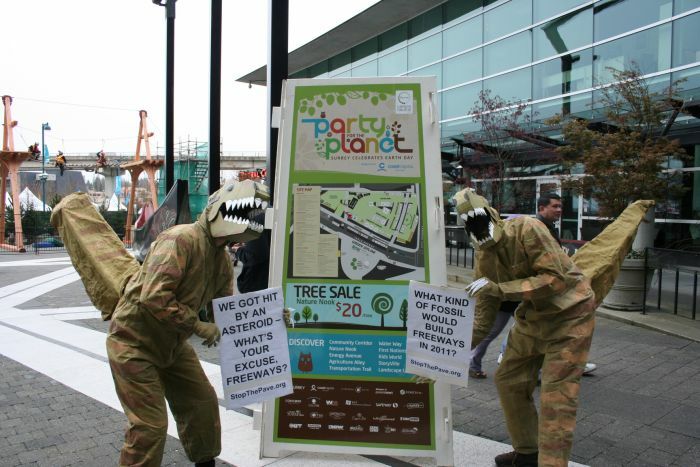 The Dinosaurs Against Fossil Fuels made a surprise appearance at Surrey Central on Friday afternoon for the opening day of the City of Surrey's 'Party for the Planet." 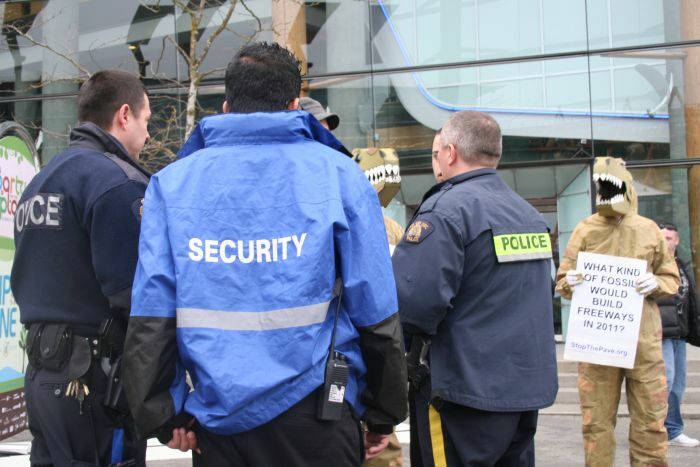 Their presence was well-received by many local residents and families; however, the security forces and police in and around the event did not extend the same welcome. 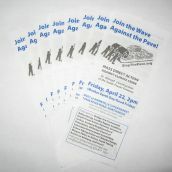 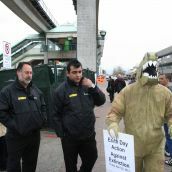 While the Dinosaurs held signs to spread awareness about the earth day Join the Wave Against the Pave action on April 22nd, flyers were distributed with details about the upcoming community mobilization, celebration, and direct action against the South Fraser Perimeter Road (SFPR), part of the larger Gateway freeway expansion mega-project. 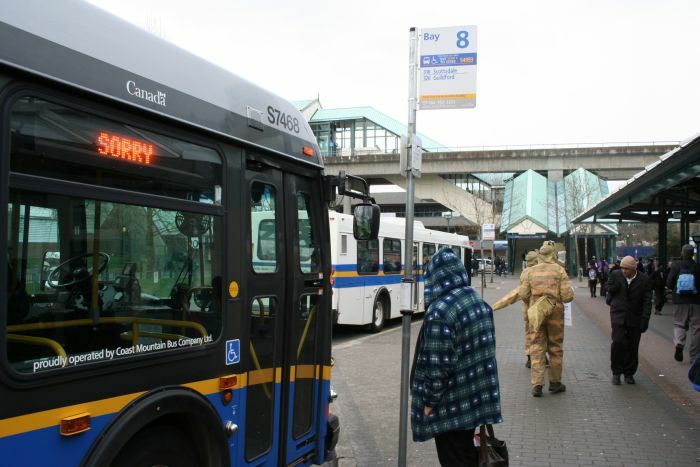 The proposed 40+ kilometer multi-lane SFPR along the south bank of the Fraser River connecting port and industrial facilities to existing routes received an environmental assessment certificate from a joint federal-provincial assessment process in 2008. 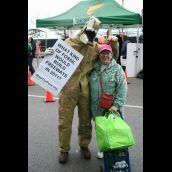 Construction of the one to two-billion-dollar first segment of the freeway expansion project, however, is still in its early stages. 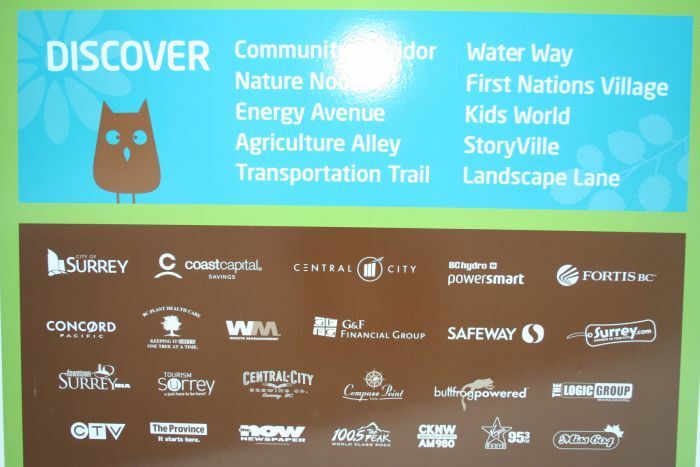 Local neighourhoods, First Nations people, organizations, students, and other concerned residents opposing the project have highlighted the expropriations of homes and farmland, the desecration of sacred sites, the destruction of ecosystems including salmon-bearing streams, and the health impacts of noise and air pollution as key issues. 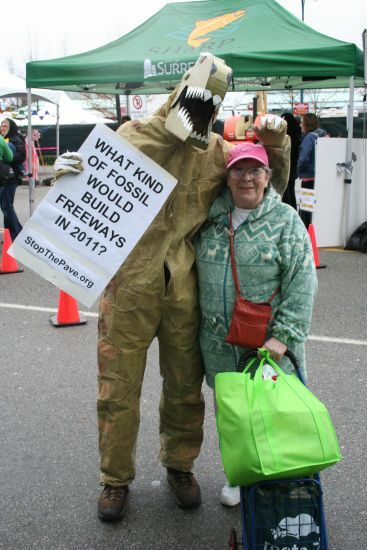 "As a mom with kids at a school near the highway ‘fall-out zone’, I want to see a stop to the insanity of paving over our last green spaces on the Fraser River just to bring more trucks and pollution to our communities," explained Surrey resident, mother, and organizer PJ Lilley in a recent media release. 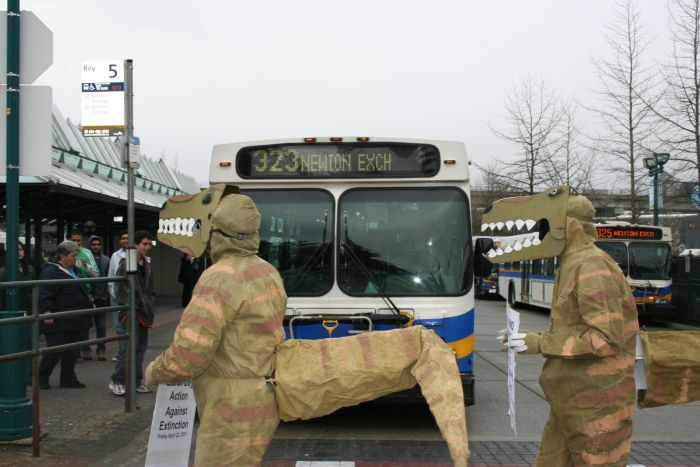 Outside the North Surrey Recreation Centre and across the bus loop, the Dinosaurs were met with excited giggles from small children, photo requests from people of all ages, and friendly curiosity by many local residents who paused to take a flyer. 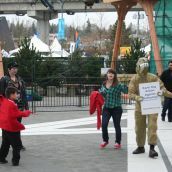 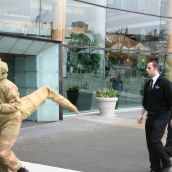 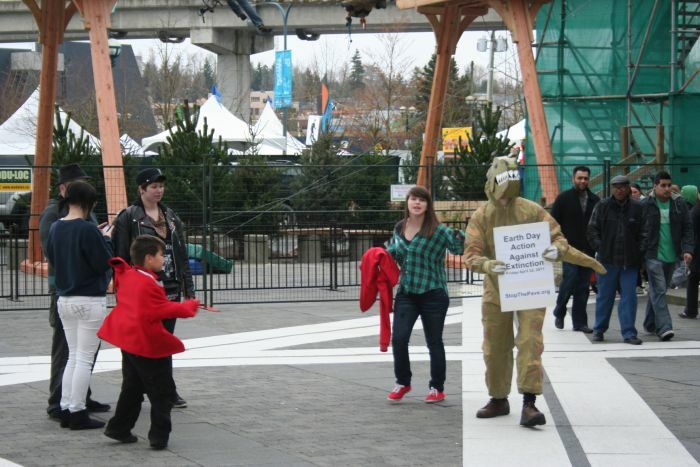 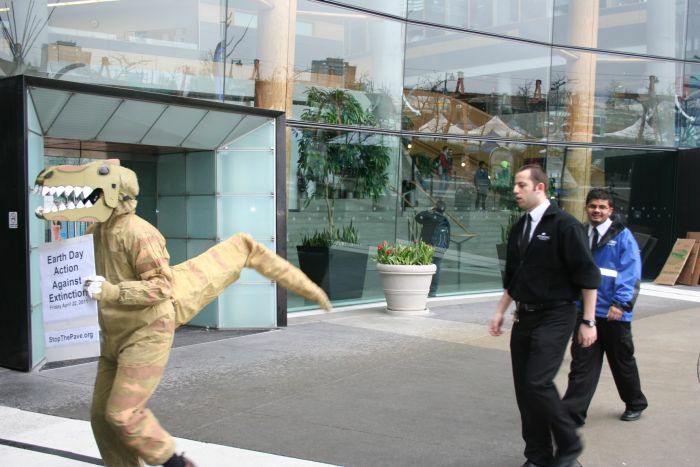 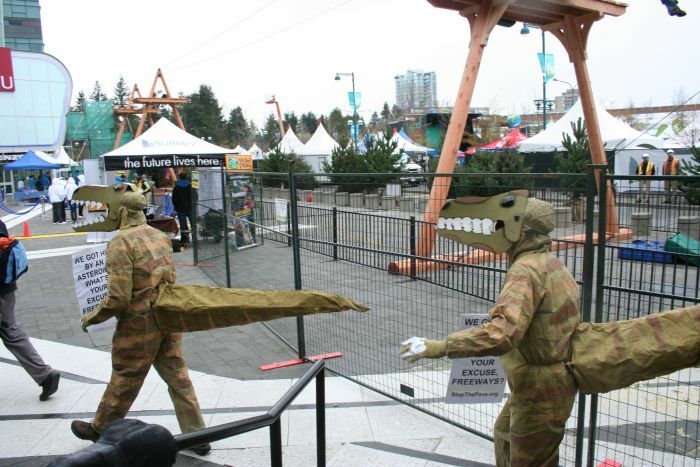 At the entrance to the event, however, the private security contracted by the City of Surrey were not amused. 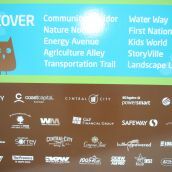 Billed as sustainable in several ways - including the use of carbon offsets in order to claim 'carbon neutrality' - the Party for the Planet had a long list of sponsors, including real estate developper Concord Pacific, energy corporation FortisBC, BC Hydro, CTV, The Province, and Central City. 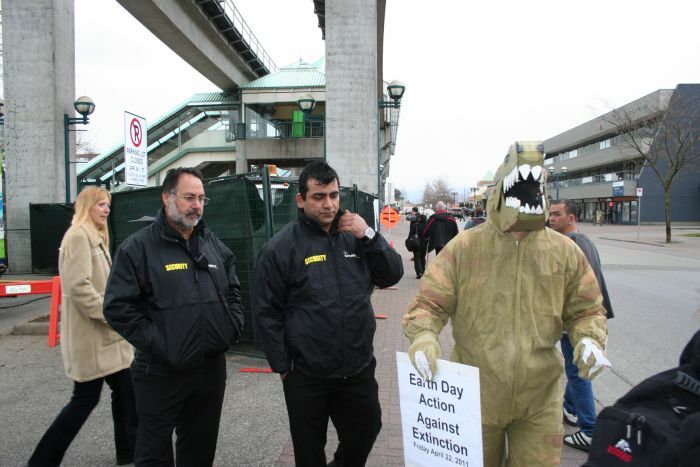 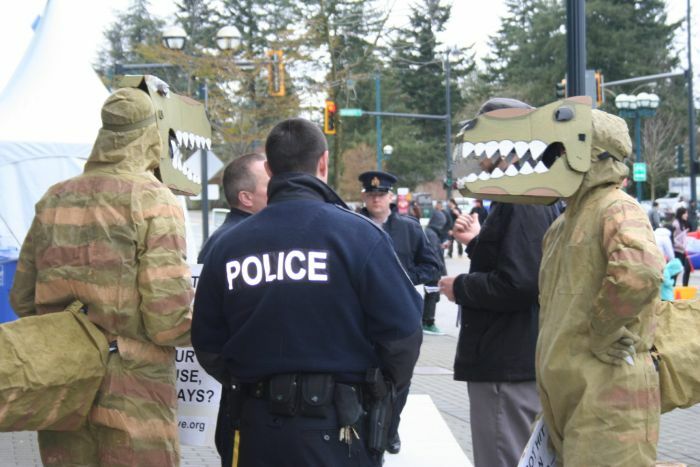 The Dinosaurs Against Fossil Fuels stated that their intention was neither to protest nor to boycott the event, but instead to join the festivities and raise awareness about the South Fraser Perimeter Road and the Stop the Pave action. 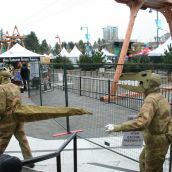 The event was free and open to the public; however, the main area was fenced and security did not permit the Dinosaurs to enter the area. 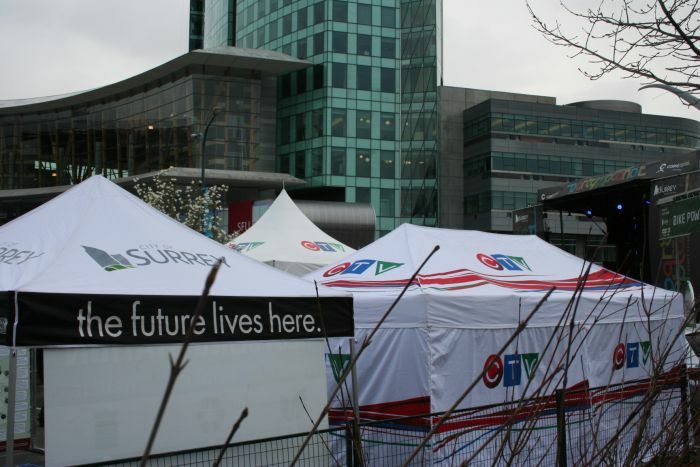 In an interview later that day, City of Surrey Coordinator of Special Events Bryan Tasaka told the Vancouver Media Co-op that the Party for the Planet was a public event and that the main fenced area - a parking lot - is city property. 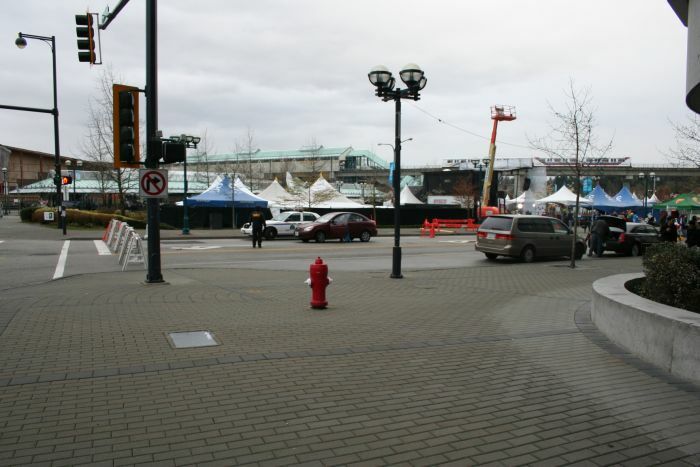 He explained that a protest area had been designated during event planning, while expressing uncertainty as to the existence of written documentation concerning the designation. 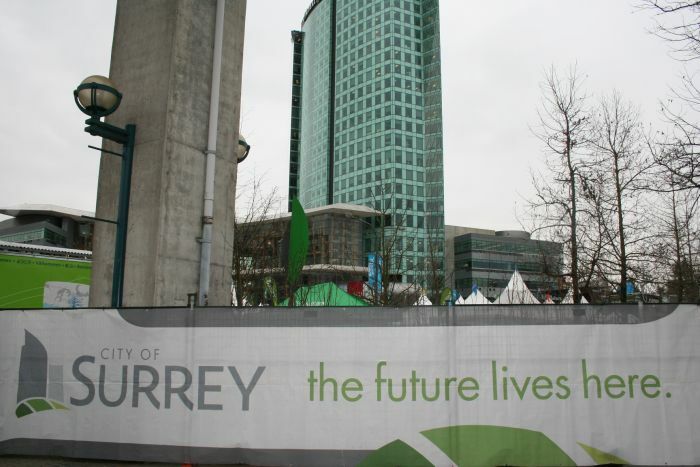 "That's the section of the site where we would allow it," said Tasaka, pointing across and up the street to the corner of 102nd Avenue and University Drive. 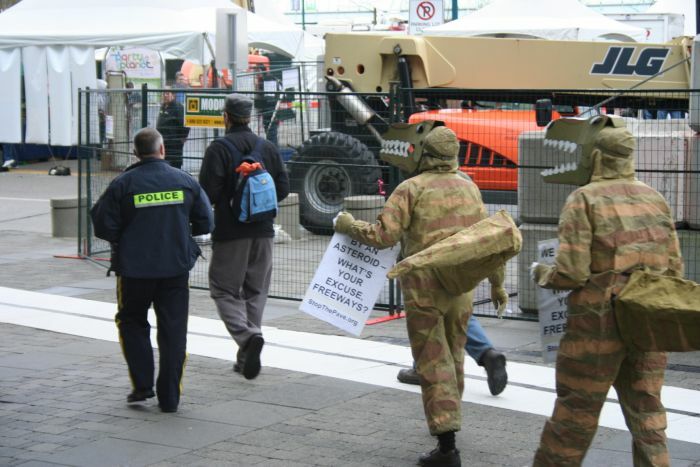 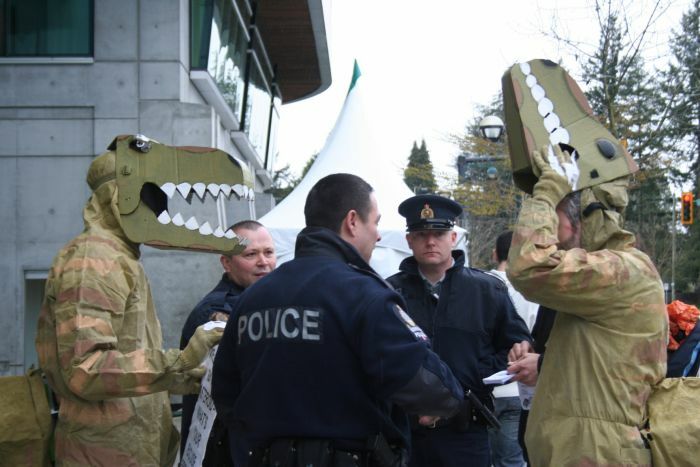 Without any notification of the unmarked designated protest zone, the Dinosaurs Against Fossil Fuels continued undeterred around the fenced area, past the $20-a-tree pick-up zone, and into the plaza outside the main Central City entrance into the Surrey campus of Simon Fraser University. 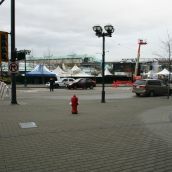 The plaza was also set up as part of the Party for the Planet celebration, as the "First Nations Village" area. 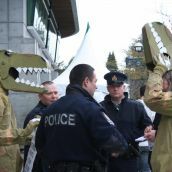 Children, youth and adults continued to react to the Dinosaurs with interest, laughter and photograph requests, but Concord security agents were quick to arrive. 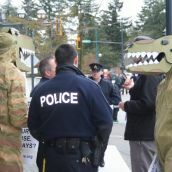 Concord agents encountered some difficulty communicating to roving dinosaurs their issue with the presence of signs and particularly with the flyer distribution and soon called in the police - in Surrey, the RCMP. 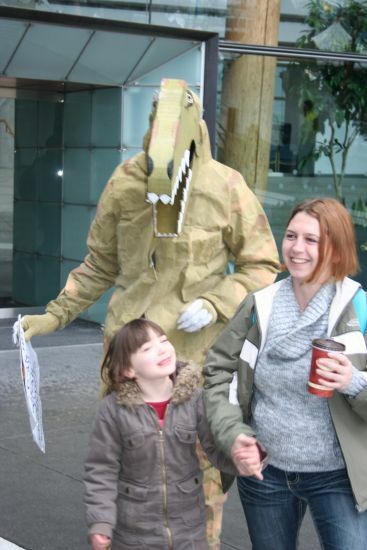 The Dinosaurs and flyering strolled over towards the sidewalk and the street area that had been transformed into a Party for the Planet area, which included a colourful childrens' salmon-spawning obstacle course laid out on the pavement. 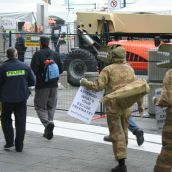 Security and police trailed behind and then caught up and threatened arrest, as passers-by continued to pause and watch. 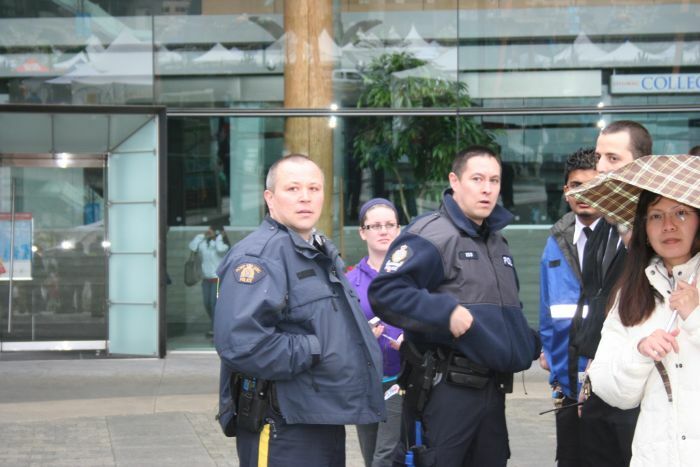 One local organizer was briefly detained. 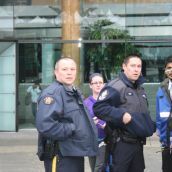 RCMP Constable Forseth told the Vancouver Media Co-op that the individual was detained for investigation for 'assault by trespass.' 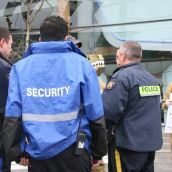 In response to queries about the plaza property in question, Forseth responded that Concord Security were property representatives for the mall. 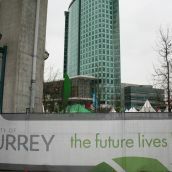 "We are the property manager," Blackwood Partners Inc General Manager Bill Rempel later told the Vancouver Media Co-op in a brief telephone interview, adding that Blackwood manages Central City on behalf of property owner Surrey CC Property Inc.
"We are the duly authorized agent for the owner," said Rempel. 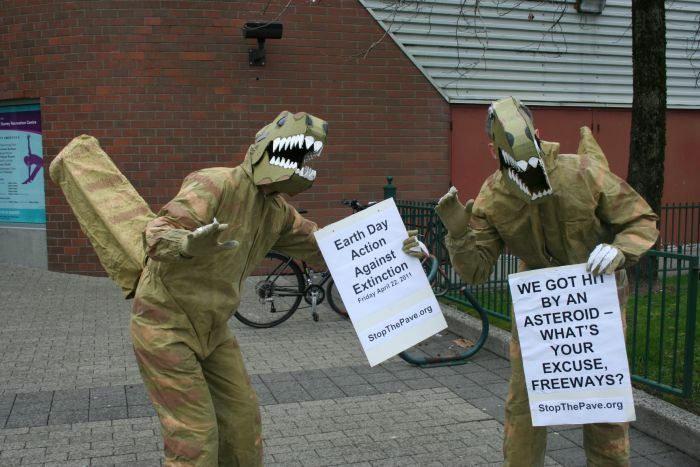 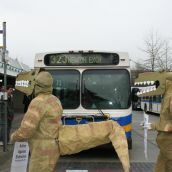 After the brief detention ended, the Dinosaurs Against Fossil Fuels completed the stroll around the fenced festivities and made their way back to the bus loop, passing out flyers to public transit users along the way. 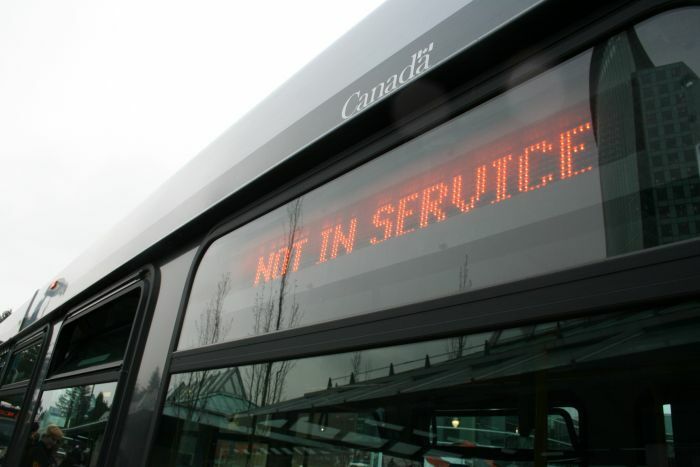 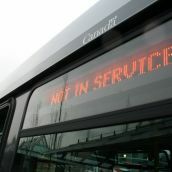 Among the TransLink spring service changes that will come into effect this Monday, April 18th, there are cuts to bus services in the lower mainland outside of Vancouver, particularly reducing the frequency of buses at night along many routes. 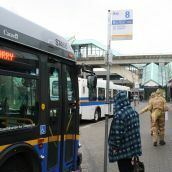 "We must stop spending public money on making the climate crisis worse, and shift the money to solutions like public transit and electric trains," stated Eric Doherty of the Council of Canadians, Vancouver/Burnaby Chapter, one of the many groups supporting the mass direct action planned for April 22nd. 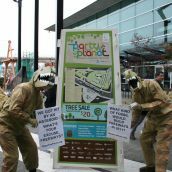 "It’s time for all concerned people to take a stand against these freeway projects that are cooking our planet." 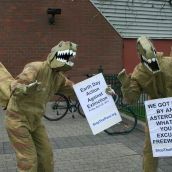 What gorgeous and brave and perceptive dinosaurs. 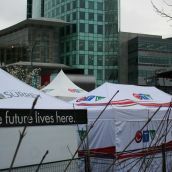 Since none of us can be everywhere, a big thank you to Sandra for this vivid window on the event. 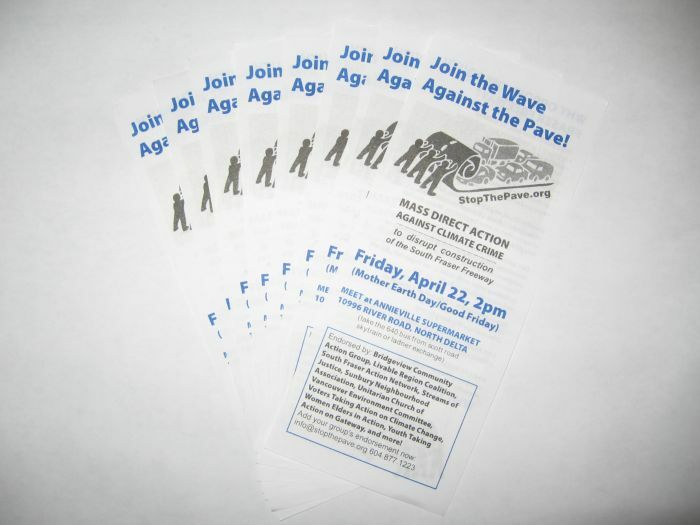 Arrest all freeways for assault by pavement!